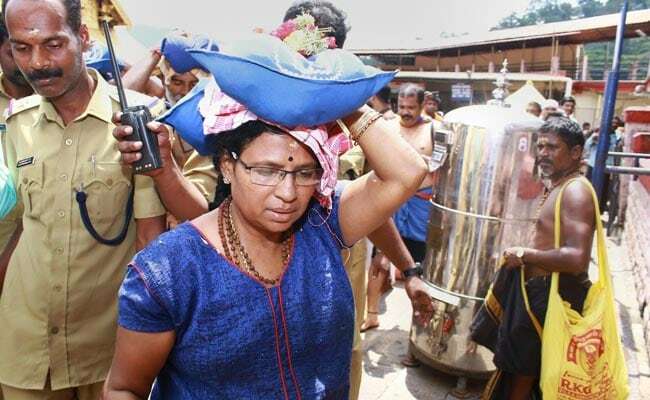 A clutch of petitions challenging its landmark order opening the doors of Kerala's Sabarimala temple to women below 50 will be heard by the Supreme Court on November 13. The 19 petitions will be heard before the temple re-opens for the pilgrim season on November 16 . Despite the top court's order, no woman under 50 years was allowed into the shrine when it opened last week for the five-day monthly puja. 'Massive protests by devotees and some priests had ensured that none of the nine women who attempted the 19-km trek to the hilltop temple could enter. A 12-day pilgrim season when lakhs of devotees visit the hill shrine, will begin on November 16. On October 9, the Supreme Court had declined an urgent hearing on the plea by National Ayyappa Devotees Association that contended the five-judge Constitution bench order was "untenable and irrational". The bench had said the review petitions could only be taken up after the Dussehra vacation. The petition by Shylaja Vijayan, president of the National Ayyappa Devotees Association has said the "faith cannot be judged by scientific or rationale reasons or logic." "The notion that the judgment under review is revolutionary, one which removes the stigma or the concept of dirt or pollution associated with menstruation is unfounded," the petition says. Another review petition filed by the Nair Service Society, a community organisation, contends that the deity at the Sabarimala temple is celibate and the tradition of women aged between 10 and 50 not offering prayers at the temple doesn't amount to their exclusion. "The delay or wait for 40 years to worship cannot be considered as exclusionary and it is an error of law on the face of the judgment," the plea said. The petition also said many "essential religious practices will be rendered void and religion itself may be rendered out of existence if the general ground of equality under Article 14 of the constitution is resorted to."